Eclectically vibrant, deeply organic or as they put it “State of the art 1970’s technology…Nasty horns…Big drums… Sweaty dance floors…Paradise!” make up the heart and soul of Hurricane Season In Brooklyn. The nine track release combines infectious rhythms with a tribal intuition that will imbed itself in you, giving you a drive to dance and rhythm in your step you never knew you had. 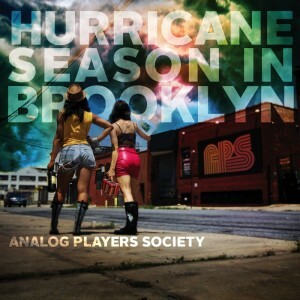 This entry was posted in Reviews and tagged Amon, Analog Players Society, Brooklyn, Cecilia Stalin, Dance Hall Days, Hurricane Season in Brooklyn, jazz, Let the music Play, music, nanobot, review, Session Players, Shannon, Wang Chung by Greg. Bookmark the permalink.